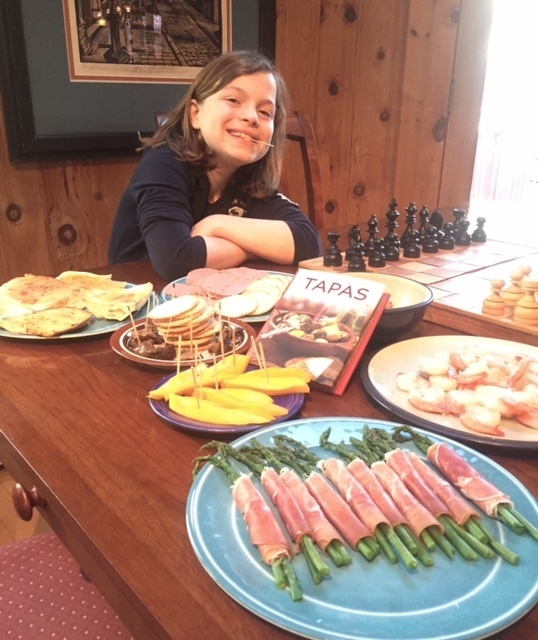 When the Grandparents came back from Barcelona a few weeks ago, they told Chloe all about the local Tapas. As many of you know, my daughter Chloe loves to cook and she was excited to cook up a storm for us. We had baked bread with tomato and garlic spread on the top, smoked oysters on gluten free crackers, shrimp with cocktail sauce and asparagus wrapped with prosciutto and cream cheese. It was delicious! Nice job on the Tapas Chloe! Their friendship goes back to 1967, when both resided at the artist’s colony, The Pheasantry, on the King’s Road, Chelsea. Mora had recently moved to London from Australia to make his mark in art and filmmaking. Eric produced the director’s first film, Trouble in Molopolis (1969). Twenty years later, the guitarist composed music for Mora’s alien encounter film, Communion, which starred Christopher Walken and Lindsey Crouse. Three Days in Auschwitz grew out of Mora’s personal investigation as mother, Mirka, avoided Auschwitz by one day. On his father’s side many perished in the Holocaust. He started filming the documentary inside Auschwitz in 2010 following a 7 film retrospective of his work at the New Horizons Film Festival. 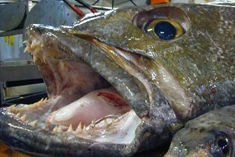 Not so beautiful… Patagonian Toothfish! Have you ever heard of Patagonian toothfish? 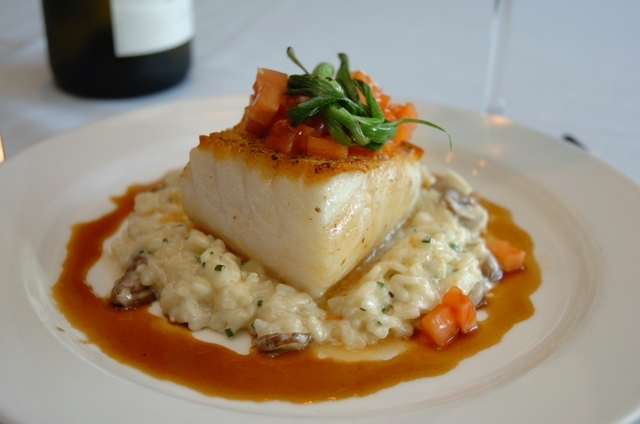 Well, chances are, you’ve eaten it — only when you ate it, it was called Chilean Seabass. 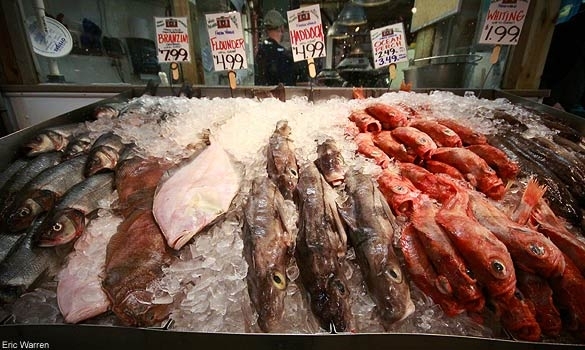 While the name change has certainly helped the Patagonian toothfish become more popular (there was a major Chilean Seabass boom in the ‘90s), it has also led to overfishing of the species. 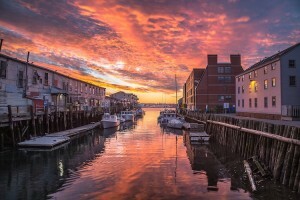 Without strict government regulation, sustainability hasn’t been a top priority and many fishermen have been fishing in areas where they shouldn’t be. 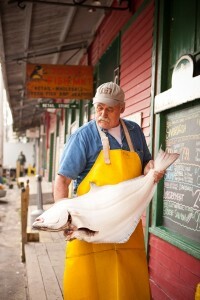 Had this fish not been renamed to make it more marketable, would the demand have been as high and led to overfishing? Probably not. It may seem odd that a fish’s name was changed to make it sound better, however it is actually more common than you may think. 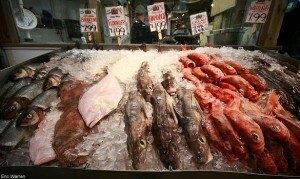 Monkfish was originally called Goosefish, Sea Urchin used to be called Whore’s Eggs and Orange Roughy was Slimehead. Harbor Fish Market is the best fish market that I’ve ever been to. I haven’t been there in years, but at my latest Stonewall Kitchen event, Chef Bethany Taylor purchased 37 whole sea bass for our main course, which was Salt-Crusted Roasted Sea Bass with Fennel, Capers and Arugula. It was fantastic, perhaps the freshest fish I have ever had. 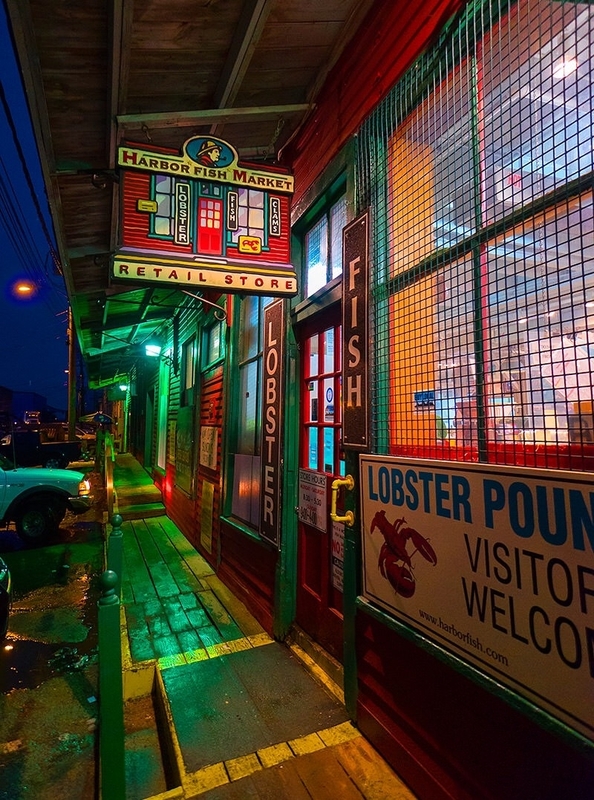 Founded in 1969 by Ben Alfiero Sr., Harbor Fish Market is still in its original location on the water in Portland’s historic waterfront district. 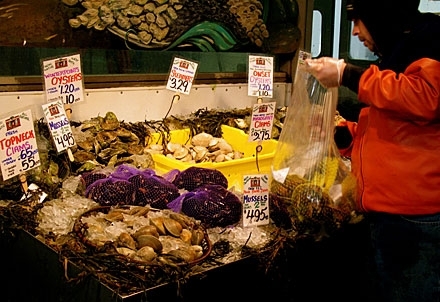 Ben along with his three sons, Nick, Ben and Mike, has forged a unique seafood company, with high quality product, strong customer relationships, with a wide, abundant array of product. 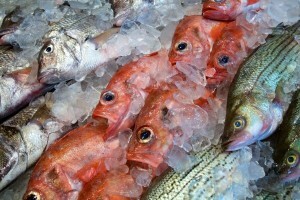 The Alfieros have committed to high quality fish and seafood across the entire operation. The adage, “if the product is not fresh enough for us to take home and prepare, then we are not going to sell it, period,” has been our philosophy in the operation for years. By committing to these extremes in quality, Harbor Fish Market has set itself apart from other seafood companies, with its unique combination of high quality, wide selection, unparalleled service and customer satisfaction. The family has developed a very special and unique place to shop along with being a fun place to visit. The picturesque and historic storefront at 9 Custom House Wharf has served as a backdrop for national and international advertisements, and is the subject of countless paintings, photographs, and post cards. Inside the store you will find a fully viewable processing room and a full view specialty cut room. 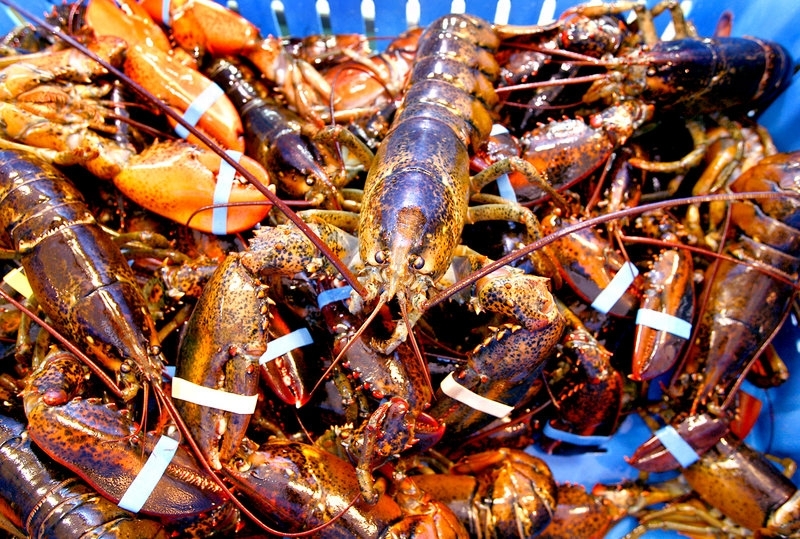 There is over 50 linear feet of display showcases, displaying top quality fish, seafood and thousands of pounds of lobsters for your dining delight. 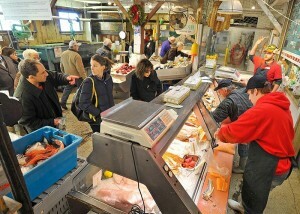 Harbor Fish consistently wins local readers polls and “best of” contests. The retail store is a stop for local shoppers, visitors and a destination for tour groups and schools. Perhaps it’s the 50 feet of mouth watering seafood display or the surging salt water tanks, that house hundred of Lobsters, or perhaps it’s the clean ocean smell, the knowledgeable sales staff, or the convenient parking at the front door that keeps people coming back for more, week after week and year after year. We invite you to come for a visit and see a true working fish market.